On Thursday, at GMT 2:00 p.m., the US based Institute for Supply Management (ISM) released its monthly Non-Manufacturing PMI figure. It measures the level of a diffusion index created by surveying purchasing managers. However, the ISM’s PMI figure excludes the non-manufacturing sector. Last month, the ISM’s PMI figure came out at 58.6. However, the forecast for this month is set at a slightly lower figure, at 58.3. Since forming a bearish outside bar (BEOB) on April 13, the NZD/USD remained in a strong downtrend. Over the last few months, the NZD/USD fell by around 650 pips. However, last Friday, the pair formed a bullish pin bar and there is a good chance of a bullish retracement over the next few days. 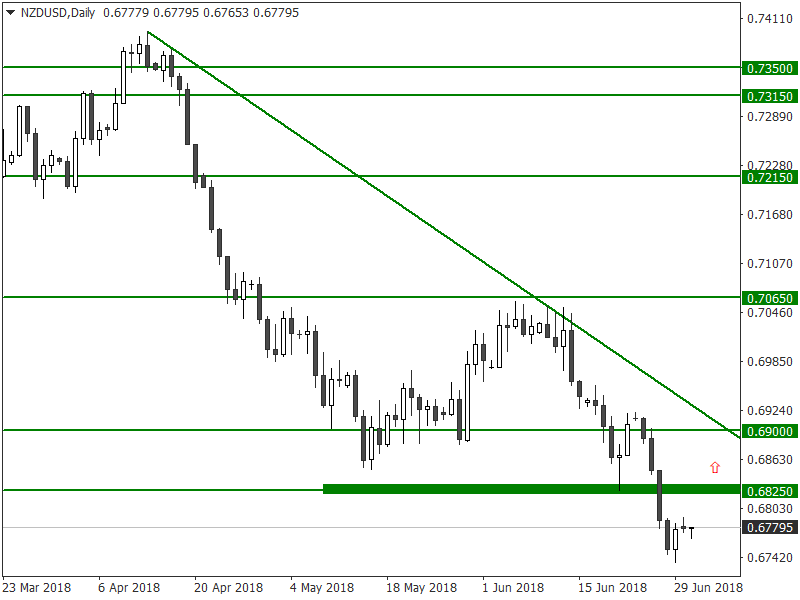 While the bullish retracement is likely, the NZD/USD needs to break above the pivot zone around 0.6825 before a strong uptrend can be established. The New Zealand Institute of Economic Research (NZIER) Business Confidence fell sharply over the last two months. On the other hand, analysts are expecting the US ISM Non-Manufacturing PMI reading this month to come down slightly compared to last month. We believe it would set a bullish fundamental outlook for the NZD/USD this week. Therefore, if the NZD/USD closes above the resistance near 0.6825, it would likely attract additional bullish momentum in the market. Hence, US binary options traders should look out for trading opportunities above this major resistance level around 0.6825. The BTC/USD remained bearish since the first week of June. 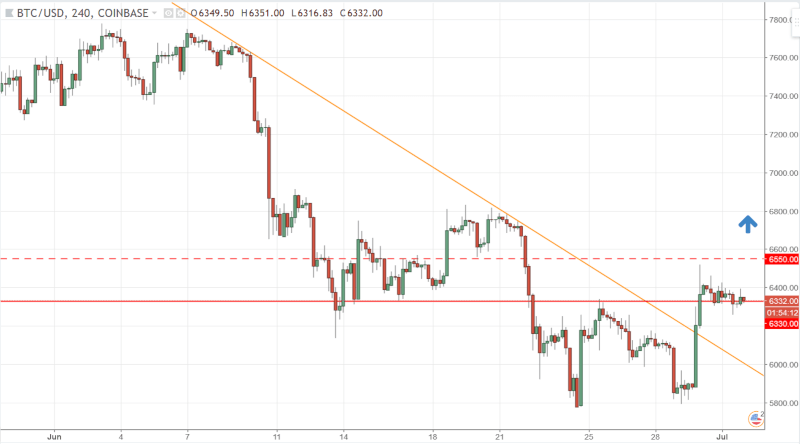 However, last week, the BTC/USD turned bullish and broke above the downtrend line on the 240-minute chart. If the bitcoin price breaks above the resistance around 6550.00, it will signal that the uptrend has resumed. Singapore based cryptocurrency exchange Huobi said it will not register with Japanese Financial Services Agency (FSA). Hence, it decided to suspend trading services in Japan, effective from July 2. However, earlier last week, Huobi announced to open new office in London and appointed a new director and COO. Meanwhile there were more good news in the cryptocurrency arena, including a lot of bullish momentum in bitcoin miners that trade on public stock exchanges around the world. The bullish momentum in miner’s stocks signaled that there is potential bullish play with the BTC/USD. Therefore, if the BTC/USD breaks above the 6550.00 level, it will likely attract additional bullish momentum in the market. Hence, US bitcoin traders should look out for trading opportunities above this major resistance level around 6550.00.